Vacation in style in this stunning oceanfront home in the upscale Hatteras-by-the-Sea subdivision. Boasting panoramic ocean views, stylish furnishings, ample gathering areas on all 3 levels, and 8 master bedrooms each with TV, private bath, and deck access, Beach Bunns has been luxuriously designed with your comfort in mind. 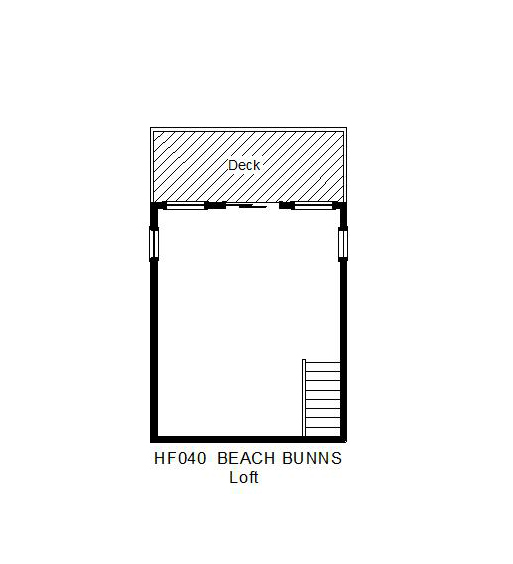 The carport area features direct access to the elevator which serves all levels except the loft, making this the perfect home for those with limited mobility. Store your beach and fishing gear right inside the ground-level entry with convenient half bathroom for easy access at a moment’s notice. 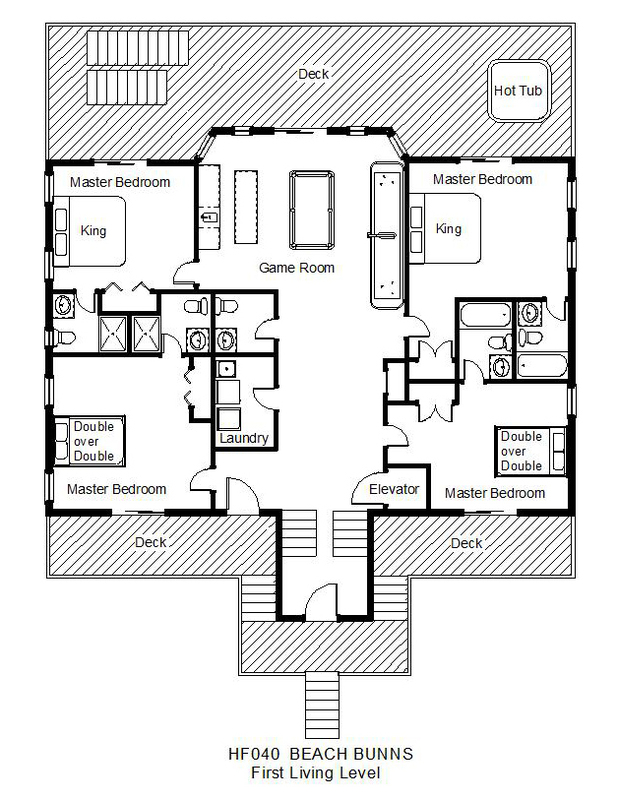 The first living level has four master bedrooms. Two bedrooms, one with a shower stall in the bathroom, each have a double-over-double bunk set. Two oceanfront king bedrooms, one with a shower stall in the bathroom, are off the game room and open onto the oceanfront deck, where you can soak your cares away in the bubbly hot tub. Engage in friendly competition in the game room with pool table and shuffleboard, as well as a wet bar with wine cooler, dishwasher, full-size refrigerator, and TV. 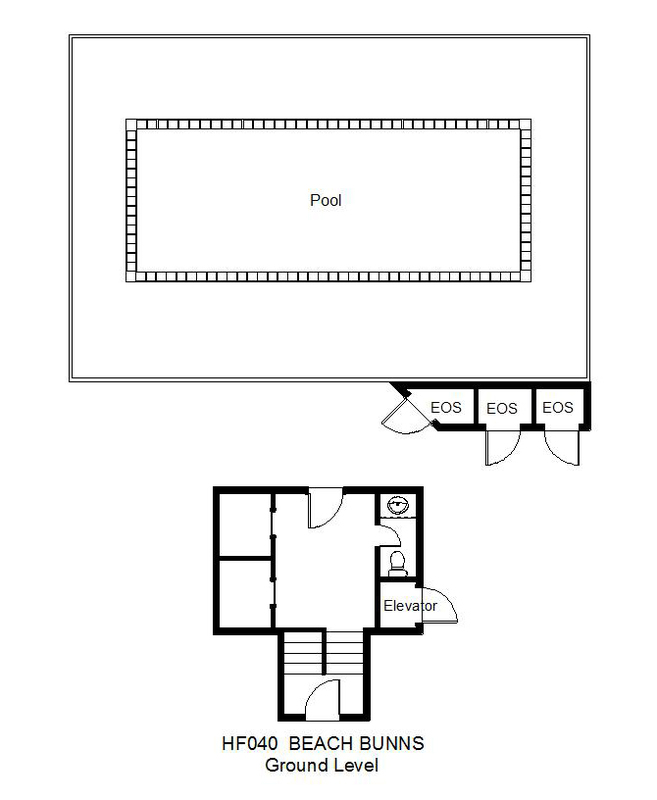 A half bathroom is also on this level, along with a laundry room with utility sink. Relax in the large oceanfront den with TV on the second level and enjoy a movie or a good book from the well-stocked shelves. Off one side of this central gathering space is a spacious king master suite with separate Jacuzzi tub and custom tiled shower in the bathroom. Another oceanfront king master bedroom and a master bedroom with a double-over-double bunk set are off the other side of the den. A half bathroom and a second laundry room with utility sink are also on this level. 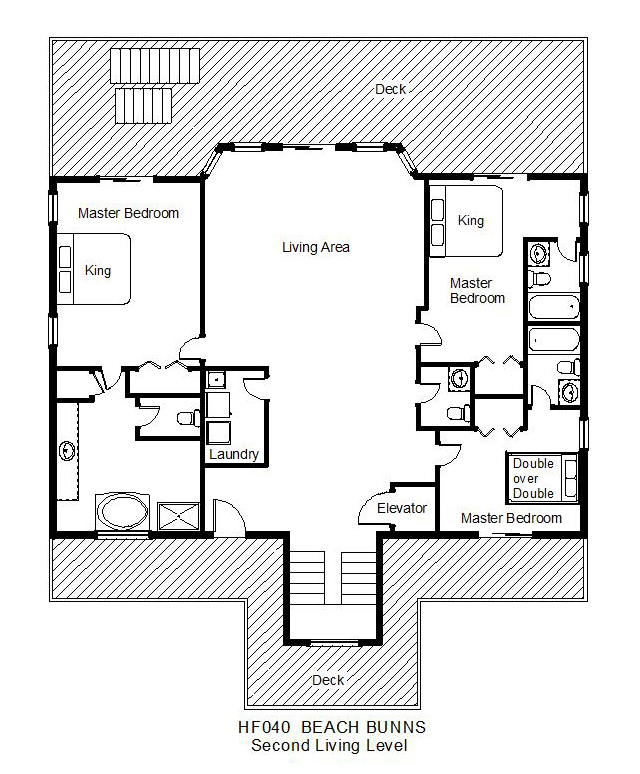 An additional king master suite is on the top level, boasting a separate Jacuzzi tub and custom tiled shower in the bathroom. Catch up with family in the open living, dining, and kitchen area with ample seating and stunning ocean views, as well as an adjacent half bathroom. The living room features a large TV with Roku 3 for catching up on your favorite shows and a gas fireplace to take the chill off those cool off-season evenings. Ample seating at the dining table, breakfast bar, and additional breakfast table provides enough room for the whole family to enjoy home-cooked feasts. The well-supplied kitchen with dual refrigerators, ranges, microwaves, and dishwashers, as well as under-counter ice maker and additional wet bar sink, will delight any family chef. Enjoy al fresco dining on the sundeck, or retreat to the loft to curl up with a good book or relax on an additional sundeck. Soak up some sun by the private pool with available heat, or head to the beach via the community boardwalk directly adjacent to the house, with access from the carport. If adventure is what you seek, a short drive or bike ride will take you to one of the nearby marinas for world-class charter fishing. Museums, art galleries, shopping, and fine dining are also close at hand from this convenient location. 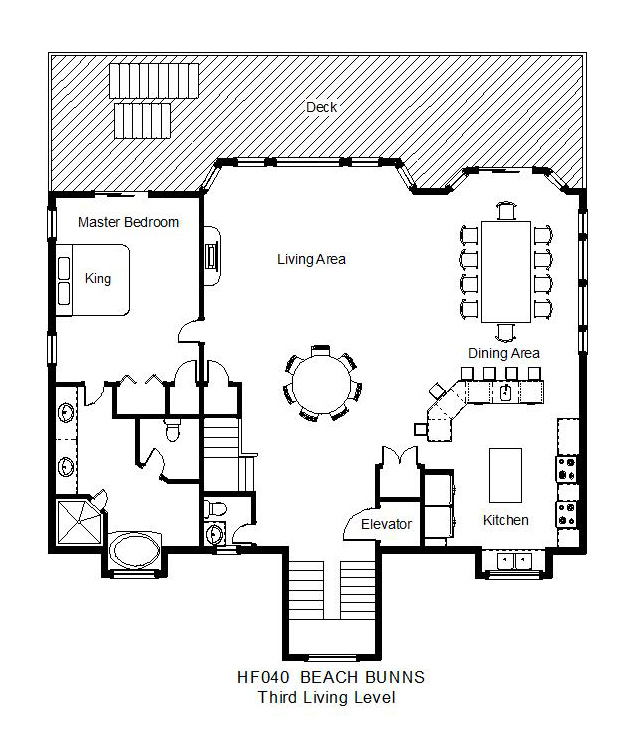 Spend your next getaway living the life of luxury at Beach Bunns. Why is Saturday May 18th 2019 blocked out but the remainder of the week is open? Aqua means available and yellow means unavailable. This house is a Sunday turn-day, so what I am seeing is that the house is booked from Sunday the 19th-26th, 2019. How do I get a list of the average rates. Curious to see if it's within our prices range and when the prices are high and begin to drop. Prices are date driven, so you would just need to enter the dates that you are interested in for pricing. Our family of thirteen had a wonderful stay at the Beach Bunns home. The view was amazing, the house was so roomy and well kept up, loved the decor. The grandsons didn't want to go home and leave the ocean. I would highly recommend this home to any large family. The ferry ride was fun. I recommend letting people know that they need to bring everything. Garbage bags, TP, etc. we enjoyed our stay and very much appreciated the pool! Overall our experience was very positive! Perfect for a good-sized family. This house is wonderful! The attention to decor is incredible, everything is so beautiful and pleasing. It felt so welcoming. And of course the view is breathtaking. We've been coming to Hatteras for several years, and this is by far my favorite home. We plan to stay here again!